Our local library held its annual (or is it twice a year?) Friends of the Library Book Sale yesterday and today. I always try to get there before things get too picked over. I also try to sneak in before Carol knows that I'm going. Why? Because another book is the last thing I need. After all...over the past three years I've had to reduce my personal library from about 5,000 volumes to a measly 2,000. So why would I want another book? I just "do. No explanation other than that. I LOVE BOOKS! Anyhow, I didn't have to "sneak" in. Carol kindly dropped me off at the library without any fuss, handed me a $1.00 as said, "enjoy yourself"! While jostling (is that a word?) for position at the "Christianity" table trying to catch a glimpse of the offerings I overheard so many weird conversations. The others at that table certainly weren't looking for my type of book. 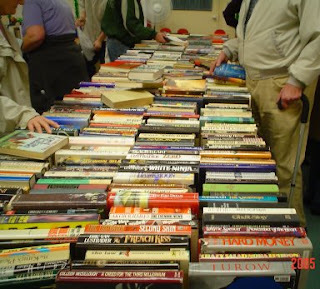 Clairvoyants, new age stuff, Eastern mysticism an all manner of non-Christian books at "my" table. Were these bargain hunters from Mars? Sounded like it. I wandered around the crowded room thinking I'd come back to "my" table when it wasn't so busy. What a motley collection of "book wormy" types picked through the thousands of volumes which loaded down the tables! Do all bibliophiles wear strange clothes, talk funny and purchase crazy books? One guy was apologizing to one of the volunteer ladies for preaching at her. She was just overjoyed to see him leave the building. Several other browsers were talking to themselves without getting an answer. Finally I was able to squeeze up to "my" table only to discover that there was only a smattering of good books available. I knew my friend Reid hadn't snatched them up earlier because he was unable to attend. After digging through several hundred books I had chosen five of them and paid my $5.00. As I approached the exit I saw the "preaching man" holding the door for everybody coming and going. He said something I didn't understand as I walked out the door. Carol picked me up in front of the library and asked what treasures I had found. I confessed that I had bought five books but that I already had three of them and one was for my friend Reid. When she asked why I had bought three books that were already on my shelf I realized that I was just as crazy as the rest of them. Can't wait for the next sale. great post fellow bookie! And, just to let you know, I've bought books that I already have too! Call me crazy, cuzzy! Enjoy your books and the week! Wish I was there!!!! Did you see that my Danny got traded again? He is home with the Blue Jays, we love it!!!!!!!! He is in Vegas. Maybe our grand -baby will be Canadian after all!!!!!!!!!!!! !